I was apprehensive to purchase furniture online, but loved this bed and loved the price, so gave it a try. I'm astounded at the quality. It's a seriously solid bed. My 80 year old dad helped me put it together, and he too was astonished at the quality (being a lifelong craftsman). It was a breeze to put together, and even came with some extra parts (as opposed to missing parts...). It took us just shy of 45 minutes after unpacking every thing. It was helpful to read through the other reviews for tips and such. I have 2 tips: 1) Yes, you definitely need two people, so go to your junk drawer and find another Allen wrench. It'll make it even faster. 2) On the last step of placing in the slats, it instructs you to insert all of the edges first, then tack down the middles. Don't do this - once you have all of the edges placed on both sides, you have no way of getting to the middle of the bed. What we did was place a left edge, the a right edge, then tack the middle - so it was ultimately like a zipper, but starting from the top of the bed down. You'll understand this more when you go to do this step. 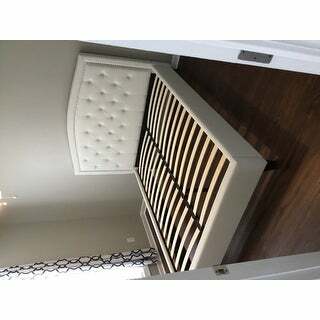 I was unable to use my existing boxspring, which was totally fine because the mattress on top of the slats is awesome. I'm on night 4 of sleeping (like a baby) and all is well. The box spring with the mattress made it way too high, so it is definitely a platform for just a mattress. And the bed does.not.move. It is that solid. I have not yet scotch guarded, but will do that. Although my son is 15 and won't be finger painting anymore, and i'm pretty careful with stuff, it is a white bed. There was a bit of something on the corner of the headboard, but it wiped off easily with a damp cloth. Overall, i'd do this again in a heartbeat. There was zero problem with shipping, easy set up, and a really solid product overall. And it looks beautiful! Stylishly crafted for comfort and charm, the lovely Hampton White Tufted Upholstery Platform Bed by Abbyson is a fantastic addition to any bedroom. The bed features a white upholstered headboard and silver nailhead trim. The bed is available in 3 (three) sizes to ensure you can find the one that is right for you. Dimensions 60.0 In. X 83.0 In. X 49.0 In. I purchased the Abbyson Hampton bed after reading good reviews but now realized maybe I was misled. The bed came at decent time but the headboard was broken and wrong size. I ordered full size but it came full/queen. I immediately called customer service and still waiting on the replace headboard. It has been going on 3 weeks now after initial call back and still no headboards. 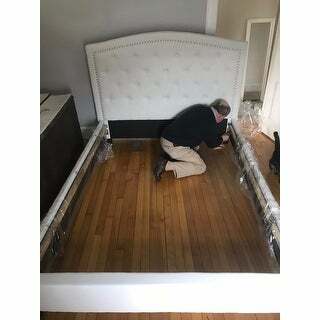 We put the bed together before realizing broken headboard and also notice that there is a huge gap exposing frame because it was not true full size as it was advertise. Putting bed together was not easy and very time consuming. Although I could return the bed and get my money back because of the time spent putting it together I am stuck with this bed. Over all I will never make another purchase again. I absolutely love this bed. I was looking for a platform bed that is not too low to the ground and this bed is the perfect height with our 13inch mattress, although even with a thinner mattress the height would be fine. The fabric is really nice and does not look cheap at all. The description on the site says its Ivory but some of the reviews said it was white and it is white which is exactly we wanted so it goes perfectly with my gray walls and bedding. Would highly recommend. 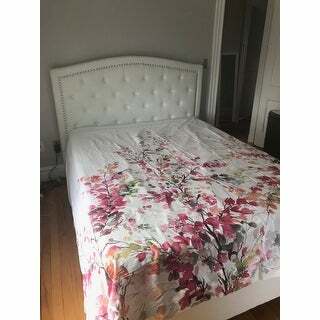 What a beautiful bed.. this is full size mattress with only a thin box spring. Very easy to assemble my daughter loves it..
Like the bed it is really pretty. It was a little difficult is put together as previous review stated, all holes for screws not aligned, had to drill to get to insert properly, but overall not too difficult. It is low, but it is a platform not to be used with box springs. Color is white not tan or beige. Nail heads are a bright silver. Nice product for the money! Beautiful ! Perfect for a 11x11 room . A lot of time putting bed together , but well worth it! Thank you ,Overstock ! It is a beautiful bed love the color. I bought king size perfect for my family. Great, sturdy construction with an elegant design. We love it! I purchased this bed on May 29 and received it June 6. The bed is beautiful; however, the 2 pieces that support the headboard does not provide enough stability. One of the pre-drilled holes did not line up which didn't help the situation. There either needs to be more screwing points or brackets added to help support the headboard. You also don't need a box spring if you want to see the details on the headboard. First of all, the bed is beautiful and didn't disappoint - A+. However, I would like to give shipping an F. I ordered the bed at the beginning of Dec and it wasn't delivered until the last day of January. Lodeso/Schneider, the carrier that Overstock used in the Chicago area was completely incompetent. After sending multiple emails to Overstock to check on the status, and 3 missed deliveries, it was finally delivered. When the delivery arrived, they informed me that they couldn't bring the bed upstairs because they didn't carry shoe covers in their truck (I didn't want them wearing their work boots upstairs on white carpet). I hope Overstock rethinks their relationship with this carrier. On a positive note, the customer service department at Overstock was helpful and did follow up with me. Unfortunately, I probably won't ever order furniture through Overstock again. The bed was a Christmas present for my daughter, and it was a headache. Love this bed frame. Easy to set up, and looks amazing. Very sturdy as well. This bed is absolutely rich in color and style! Quality is far more than exceeded my expectation. It creates an elegant space that doesn't break your bank. My husband and my son put it together within a couple hours. Love this bed! Sturdy and beautiful. I was reluctant to order a bed online in fear of the return process, but taking the chance was worth it! The bed is beautiful and solid. No need to worry about returning it. It was super easy to put together and I can say enough about how pretty it is. I love the look and easy to assemble once you find the instructions and parts in the headboard. The instructions first statement was to open the back of the headboard for parts but some genius put this paper into the headboard too. "Can his bed be used with an adjustable platform bed and mattress? I see the question a couple of times without an answer. I purchased the posture lift queen size adjustable platform and j am looking for a bed to work with it. " Yes, this bed can be used with a platform and mattress. "Does this conform to California's prop 65? Why is box spring recommended when it is not displayed with one?" Yes, this item conforms to California prop 65 standards. A box spring is recommended. "I have ordered the Abbyson Hampton upholstered bed, what mattress do you recommend? Can I shop at a local mattress company then order from you? Conflicting messages in the remarks, one place says do not use a box spring and another says yes to a boxspring. Please respond asap as the bed,is,scheduled to be delivered this week. Thanks, Pamela S."
A full size mattress is recommended since this headboard is meant for a full. A box spring is recommended. I found it too high to use a box spring. I went with just my mattress and it sleeps great. Very Sturdy. The distance between the slates are approximately 4 inches. "Who has bought the full size bed, what are the dimensions for suitable mattress (beds inner dimensions)?" "The King AND the Queen both show 87 inches wide? Am i missing something here? 82" deep vs 66" deep? Is that actually the width and both beds are 87" DEEP? Please advise. Thanks! Queen measures 53 inches high x 87 inches wide x 66 inches deep King measures 53 inches high x 87 inches wide x 82 inches deep"
"Queen: 49"" H x 87"" D x 80"" W. King: 49"" H x 87"" D x 87"" W". "can you not use the slats and instead use a platform for a sleep number bed"